A study by VIMS Professor Rob Hale and PhD student Da Chen reveals that birds of prey in China have some of the highest levels of polybrominated diphenyl ethers (PBDEs) ever recorded in an animal. PBDEs, a class of chemicals added to many household products to reduce their flammability, are of growing environmental concern, based on evidence that they are toxic, persist in the environment, and accumulate up the food chain. Hale and Chen became interested in studying PBDE levels in China based on the large number of electronic products manufactured there, and the growing number of used electronics that are transported to the country for recycling. The study was published in Environmental Science and Technology. According to researchers, the paper’s findings are remarkable for documenting that the Deca PBDE formulation used predominantly in China—now the only PBDE formulation used in Europe and North America—can bioaccumulate to a much greater extent than previously believed possible. “Deca” refers to the 10 bromine atoms within each molecule of this most common PBDE formulation. Two other formulations, Penta (with 5 bromine atoms) and Octa (with 8 bromines), are known to break down more readily in the environment. These compounds have been banned in Europe and discontinued in North America. Hale and Chen reported recordhigh levels of the primary constituent of the Deca formulation, brominated diphenyl ether (BDE)-209. They tested 8 species of birds listed as National Key Protected Wild Animals in China, including hawks, owls, and buzzards. 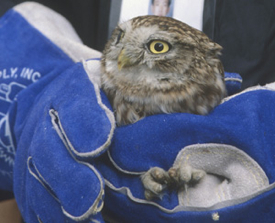 The birds, which had died from other causes, were donated by the Beijing Raptor Rescue Center. Chen analyzed them at China’s State Key Laboratory of Organic Geochemistry in Guangzhou. Common kestrels from Beijing harbored the highest levels of both overall PBDEs and BDE-209. The most contaminated bird was a kestrel with 40,900 nanograms of total PBDEs per gram of liver tissue, including 12,200 ng/g of BDE-209. Hale says this is by far the highest level of BDE-209 ever reported in wildlife and is close to the maximum concentration of total PBDEs recorded for a single animal. Barnett Rattner of the U.S. Geological Survey’s Patuxent Wildlife Research Center has been evaluating how PBDEs may impact American kestrels, which are similar to the common kestrels evaluated in Hale and Chen’s work. Rattner and graduate student Moira McKernan have found that the lowerweight PBDE compounds associated with Penta and Octa formulations can affect hatching success at “levels higher than, but approaching, what we see in the environment.” Hale and Chen’s study documents significant quantities of these compounds in the common kestrels as well as in two species of sparrowhawks and long-eared owls. The $64,000 question is whether these Chinese birds are taking up the lower-weight PBDE congeners by breaking down the BDE-209 from the Deca formulation or by getting them from other uses of the Penta and Octa formulations, Rattner says. Neither Penta nor Octa is known to be used in great quantities in China. The presence in some of the Chinese birds of high quantities of BDE-207 and BDE-208 (compounds not found in the Deca formulation) suggests the BDE-209 is being broken down into lighter-weight PBDEs, points out Linda Birnbaum, Director of the Experimental Toxicology Division of the U.S. EPA’s National Health and Environmental Effects Research Laboratory. However, “it is very difficult to determine if the [congeners such as BDE-207 and BDE-208] are the result of debromination and metabolism within the birds,” says Heather Stapleton at Duke University’s Nicholas School of the Environment. “It is feasible that you could be getting BDE-209 in those terrestrial environments from a landfill, and photodegradation could be breaking it down. Those breakdown products could be accumulating in insects and small rodents around the landfill.” Either way, continuing use of the Deca formulation could result in an environmental catastrophe, contends Åke Bergman, head of Stockholm University’s Environmental Chemistry Department. The finding portends that these PBDEs are probably in people as well as other terrestrial animals in China and that widespread use of Deca in Europe and North America could lead to similar buildup in food chains there, Bergman says. —By Kellyn S. Betts. Adapted and reprinted with permission from Environ. Sci Technol., March 15, 2007, 41(6), 1804-1805. Copyright 2007 American Chemical Society.